Phoenix, Arizona has been attracting active adults since Del Webb opened the first Sun City in 1960. Active adult communities in Arizona were the first developed in the country. Still today, Phoenix, Arizona is one of the most popular retirement destinations in the country. The area’s hot, sunny weather, affordable cost of living and numerous resort-style communities continue to draw retirees as both permanent residents and visiting snowbirds. It is also a prime vacation spot for retirees who want to enjoy a bit of desert sun. Del Webb’s original Sun City opened its doors on January 1, 1960, starting a new trend in 55+ living. Since that time Del Webb, Robson Communities, Shea Homes and many other respected builders have developed impressive active adult communities in the Phoenix area. These diverse developments range from sprawling golf-course communities with over 10,000 homes to intimate neighborhoods with only a few hundred homes. Sun City remains the largest of active adult communities in Arizona, with over 26,000 homes, 11 golf courses, 7 recreation centers, 19 shopping areas and many additional recreations and services. Yet Del Webb also offers several other large, amenity-rich communities in the area, such as Sun City West, Sun City Grand and Sun City Festival. 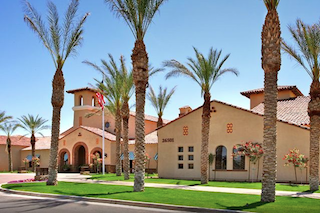 Though Del Webb is a large presence in the Phoenix area, other developers have also created many luxurious communities which continue to be popular with active adult homebuyers. Robson Communities features upscale, resort-style living with sprawling developments such as PebbleCreek and Robson Ranch. Shea Homes also brings its signature green homes and healthy living to the area with acclaimed communities including Trilogy at Vistancia and Trilogy at Encanterra. Active adult communities have flourished in the Phoenix area in part due to its hot, sunny climate. Located in the northeastern portion of the Sonoran Desert, Phoenix averages 211 days of sunshine each year. It has warm winters with days in the mid-60s to low 70s, and nights which rarely fall below the mid-40s. Yet, summers are very hot with days that commonly exceed 100 degrees. Sun City Festival is the newest Del Webb 55+ community set at the base of the White Tank Mountains. Because of its warm winters and very hot summers, Phoenix attracts many snowbirds in addition to its year-round residents. These migrating active adults enjoy the sunny, warm winter months in Phoenix while returning to more northern climates during the heat of summer. Snowbirds who return to Phoenix year after year may come from cooler regions throughout the United States and Canada. 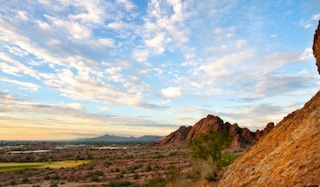 In addition to its sunny weather, the Phoenix area offers plenty of recreation for visiting or resident active adults. Golf is a popular recreation throughout the Phoenix area and golfers can choose from a wide range of beautiful and challenging courses. Just a few popular courses in the area include The Boulders Golf Club, Troon North Golf Club and TPC Scottsdale. Many active adult communities throughout Arizona feature their own golf courses as well. Other area attractions include diverse shopping centers, restaurants, museums, full-service spas and outdoor sanctuaries like parks and gardens. The Desert Botanical Garden displays some of the most interesting plants in the world, while the Heard Museum and Phoenix Art Museum each offers inspiring exhibits. Downtown Phoenix supports the arts with multiple galleries and performance venues, and sports fans can also cheer on local teams like the Diamondbacks and Phoenix Suns. As one of the country’s most popular retirement destinations, the Phoenix area provides active adults with a wide selection of fabulous communities and diverse attractions.